Hello there. Well over a month has managed to slip past! We've had a lot going on so there are a lot of updates needed! I keep playing this game with myself of wanting to have some good photos to show you, but never being home when the sun's up so to make sure I get some progress pics I take iPhone pictures in the dark... and so that's what you're going to get a lot of. Hopefully for final pics I'll get some good pics that show the true colors of these spaces but until then, enjoy the large variation in colors! To back up a bit... we bought this house for many reasons but one big one was the huge playroom space on the second floor. 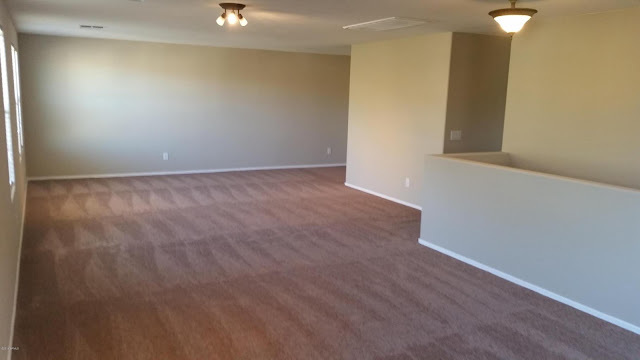 This model of house comes in a 4 bedroom and 5 bedroom version and the difference is the space at the back of this room can either be playroom or a 5th bedroom. 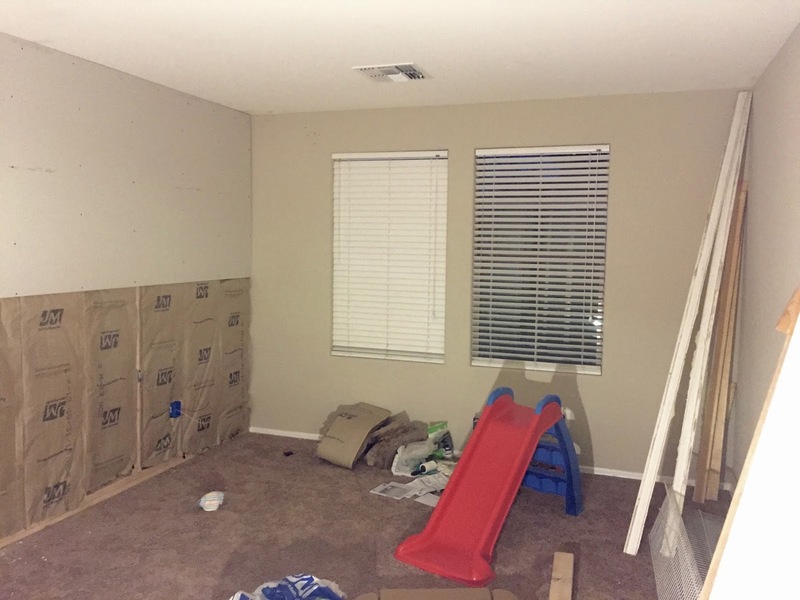 With baby girl coming and the rest of our house situations, we decided to turn our 4 bedroom version into the 5 bedroom and have the new bedroom be the baby's room. We pulled a permit to put in this new room, as well as a lot of other rearranging on this floor that I'll get to later, and got to work. In the permitting process we had to draw up blue prints of the new layout so we already knew where the new walls were going. This meant that as soon as we got the go ahead, Nate started building the new main wall and thew wall to close in the closet. 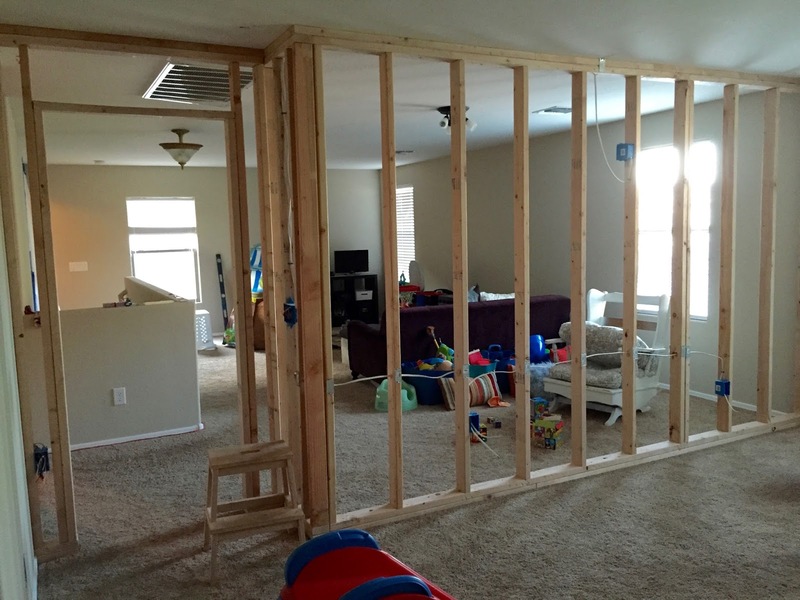 It's always impressive how fast framing out new walls can go.... Nate had them up within a couple of days of getting the permit. Nate did all the wiring and then we put in insulation before putting up the drywall. Since this is the wall between the baby's room and the playroom, we wanted a pretty good sound barrier. It worked really well. If you are in the room with the door closed, you can't hear anything outside the room. Once the drywall was up. we mudded all the seams. 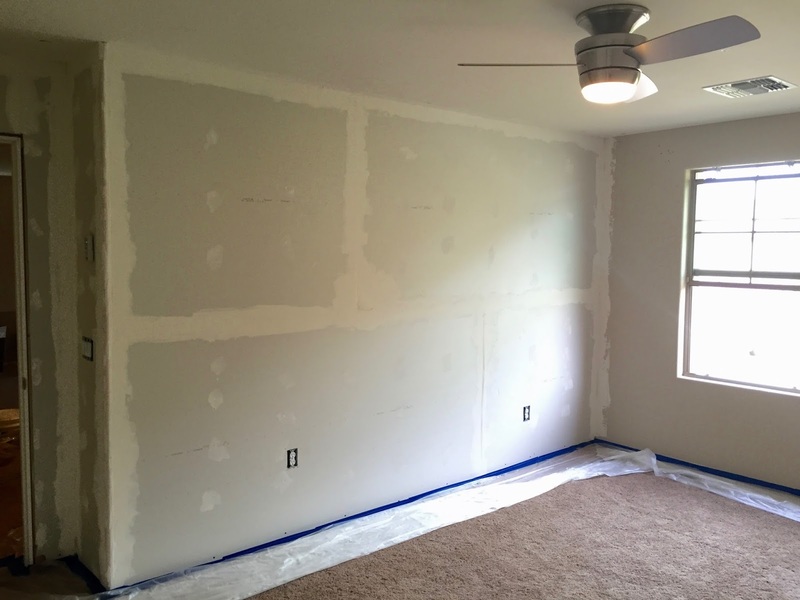 This is probably one of my least favorite tasks and since this house has textured walls, all the seams got mud and then the whole wall got a texture treatment with more mud.... not much fun but we didn't want the new walls to stick out as new. Luckily the AZ lack of humidity means everything dries super fast and I was able to paint shortly after finishing the mudding. The new walls got primed and painted while the old walls just got paint. 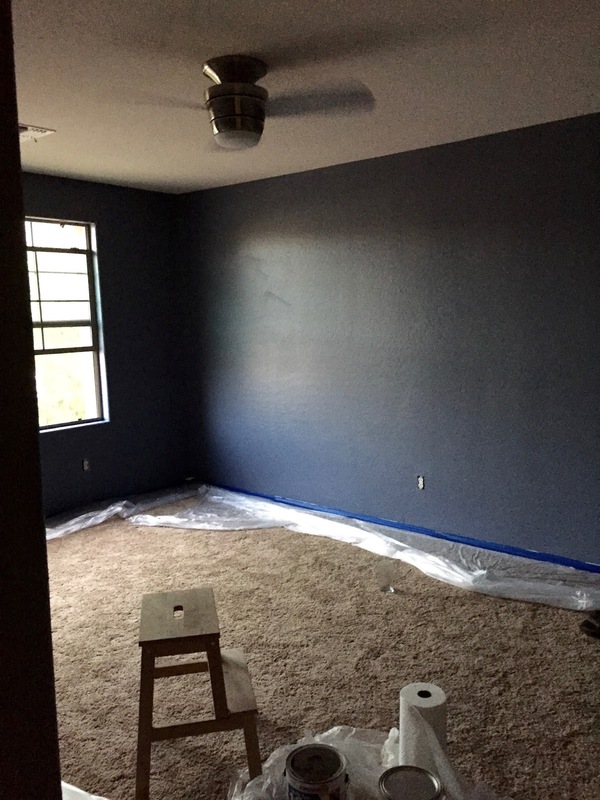 I wanted a more sophisticated feel to the nursery, so I went with darker walls. The last picture in this post is closest to the true color, which is Seattle Haze by Valspar. It's a greyish purple color and is the perfect neutral for the magenta and mint nursery I have planned. 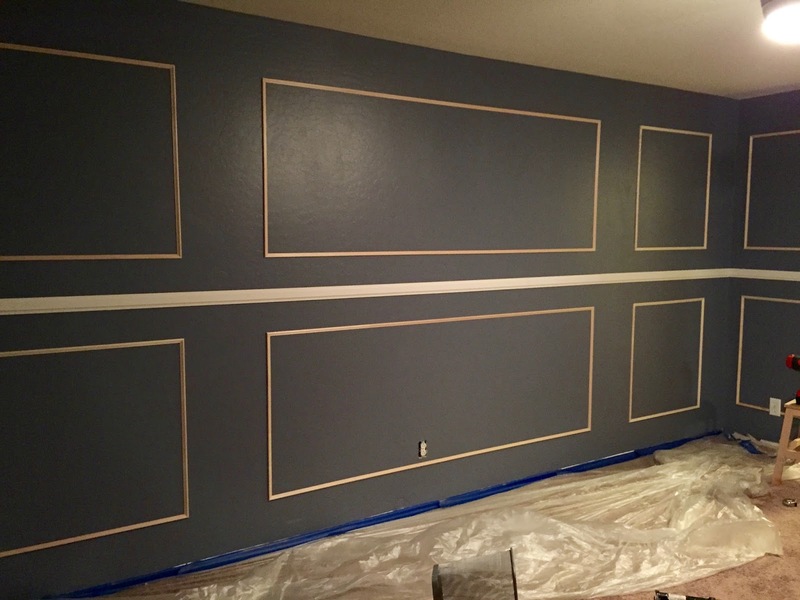 Normally we would end there but this time around I wanted to add a little more interest to the room so I decided to spend an entire weekend putting moulding up on the walls. We're going to call this a labor of love since it was WAY more time consuming than anticipated, but I love how it came out. I put up chair rail up in the middle of the wall and then built the boxes from smaller trim. I generally used the rule of thirds to determine how big to make my boxes and where to place them. 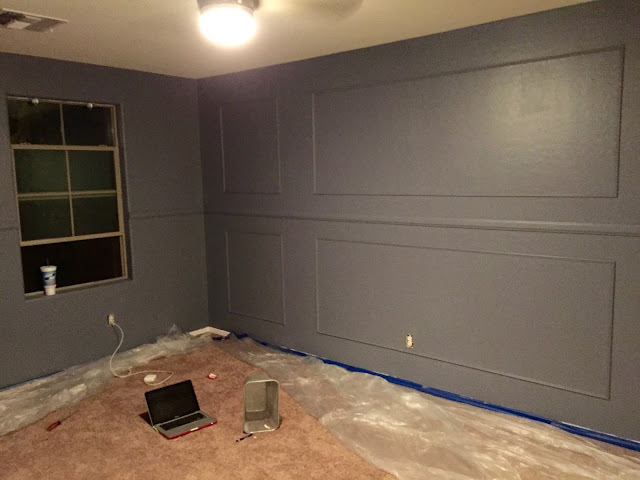 To make the moulding an accent and not the main focus, I painted everything the wall color. 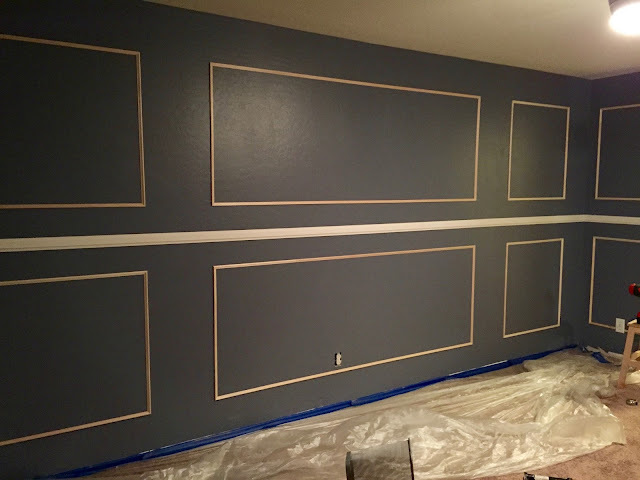 This way, once I add the other colors in this room for the nursery, the walls can stand out without being too busy. This is now my favorite room in the house, which is great since we are using it as our room right now! We've had to do a lot of room swapping to get all our renovations done, so we moved into the nursery and set up part of the room with the crib and glider and such. That way, if the baby decides to make an appearance before we are finished with our room, we can all be on the same floor as the kids and the baby can be in the nursery from the beginning. So that's where we're at with the nursery. I would show you the current state, but it's pretty much a hot mess of furniture and clothes and my huge maternity pillow... not a pretty sight. It's much nicer to look at the the moulding. We'll do a final nursery reveal when we're out of the room, which will hopefully be in the next few weeks!